This has been quite an ‘Oaty’ month in my house. 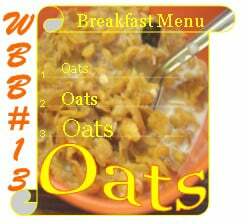 I could lay my hands on some Quick cooking oats and Oat Bran and I have tried to utilize their goodness to the fullest. I have been adding Oats to manydishes including some Bhel! I wish we would get some more varieties of Oats here- old fashioned, steel cut etc. The search is on…. In addition to their health benefits Oats have also introduced that ‘Feel Good’ factor in our daily lives. Just the thought that we are eating something so nutritious is making us feel nice. Oat Patties, I can say, is one of my most successful experiments with this ‘wonder-grain’. If you are a person like me ,who cannot start her day with a sweet breakfast this is something you are gonna truly like. Its spicy, its delicious, it masks the nutty flavour of Oats very well (if you don’t like it) and its quite simple to make. I have thrown in the ingredients I had in my fridge to cook up this wholesome breakfast. Toast the Quick cooking Oats in a pan till they turn to a light brown colour. (You will get the smell similar to when you are roasting Rava or Poha) Keep them aside. Heat 1 tsp olive oil in the same pan. Add the cumene seeds and the ginger garlic paste. Fry for a second and then add the chopped onions and fry till they turn translucent. Add the chopped mushrooms and fry for 1-2 minutes. The mushrooms will ooze out some water. Cook till the water evaporates. Remove from heat and cool in a bowl in which you can mix the other ingredients. Mix together the toasted Quick cooking Oats, sautxe9ed mushroom, grated tofu, beans, chopped coriander leaves, Red chili flakes, Soy sauce and salt. Knead the mixture to mix all the ingredients nicely. The moisture from the veggies and tofu is enough to hold together the mixture. If you feel it is a a bit dry and difficult to hold together dip your hand in water and knead the mixture with the same hand. Make lemon sized balls of this mixture and press to make them into round discs. Brush a non stick pan with little olive oil and fry the patties on both sides till brown and crisp. Alternatively grill the patties. To serve: For a wholesome filling breakfast- slice a whole wheat Bun or burger bun. Add a slice of cucumber, tomato. 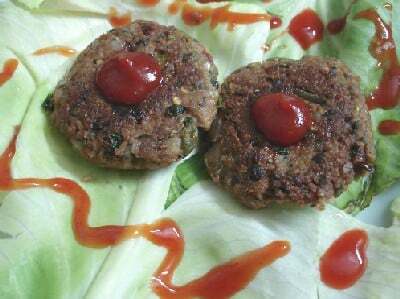 Spread some tomato ketchup and keep an Oat Patty and grill in the oven for 2-3 minutes.Serve immediately. Delicious looking patties…I love the burger Idea very much… looks inviting!!! 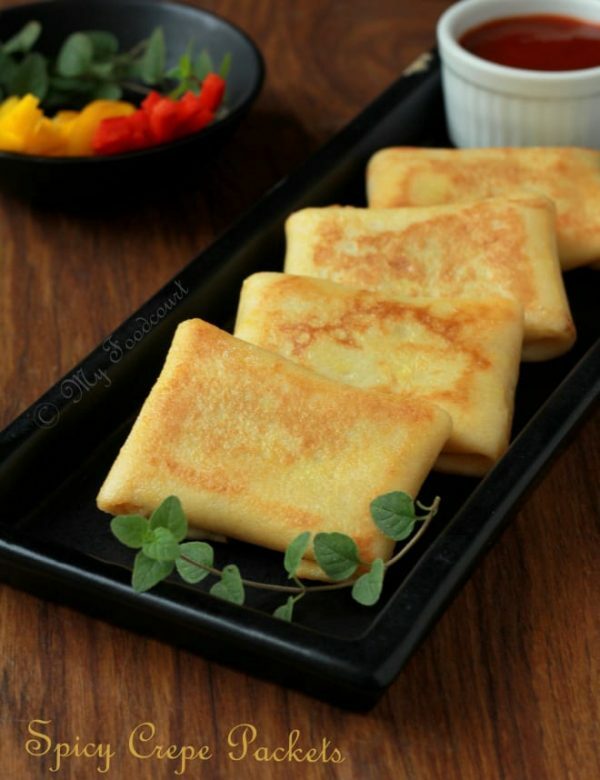 It looks so inviting Madhuli… I feel like grabbing a bite right now! A perfect wholesome breakfast. Would love to try it out! waw that’s such a different one and looks delicious. no difference form the normal patties. great entry. Like you, I don’t really enjoy a sweet breakfast too much…these oat patties look very tempting indeed! 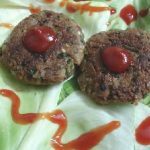 With oats prepared patties! never prepared any oat recipe. I will try this. Looks great. Thanks for sharing. Wow Madhuli , I think I will try this!! Thanks for this non sweet recipe of oats….I m sure gonna try this one..
these look delish. 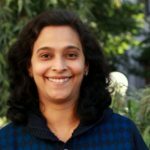 madhuli, why do we ned to roast the oats? can’t we use them as is? or powder them and use as a binder? that’s what i do, but i’m quite lazy. Love the recipe. 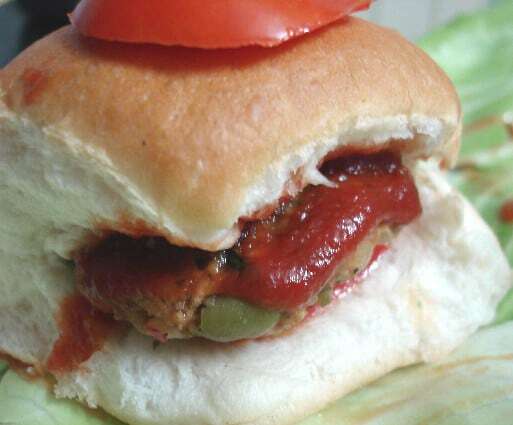 I add tomato ketchup to the patty mix, so it stays moist and has a tang which I love! Thanks all of you for your kind words. Thanks Suganya for that tip! i already have the quaker old fashioned oats…. after the roundup i will have lots of dishes to try out…. 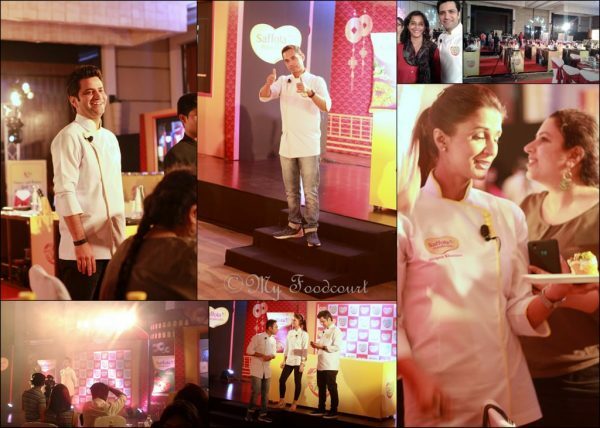 looks pretty yumm….